A unique opportunity of developing Christ-centered servant leaders exists at OCF’s White Sulphur Springs Conference Center through its EXSEL discipleship program. EXSEL (Experience, Serve, Lead) interns learn the value of selfless service while ministering to the needs of the military members and their families who visit White Sulphur Springs to experience the rest and refreshment afforded by this picturesque refuge. The interns operate in a variety of ministry areas, including office management, culinary arts, dining services, hospitality, and facilities and maintenance. They also engage in special projects. This year, the forested Allegheny Mountains of White Sulphur Springs provided a suitable setting for the spiritual and vocational development of the EXSEL interns as they tapped into the plentiful sugar maple trees and established a maple syrup production capability. With minimal staff assistance, the interns researched the syrup-making process, performed cost analyses, identified and marked trees, sourced materials, and drafted building plans. They then prepared a detailed decision package, pitched their idea to senior leadership, and launched the project upon approval. The interns participated in harvesting and milling on-site standing dead maple, oak, and locust wood, selected a suitable building site, set the corner posts, hauled shale for the foundation from the on-site quarry, and fashioned a roof of recycled sheet metal. As the walls and door of their “Sugar Shack” took shape, the wood-fired evaporator, canner, and other necessary supplies were ordered, delivered, and assembled. 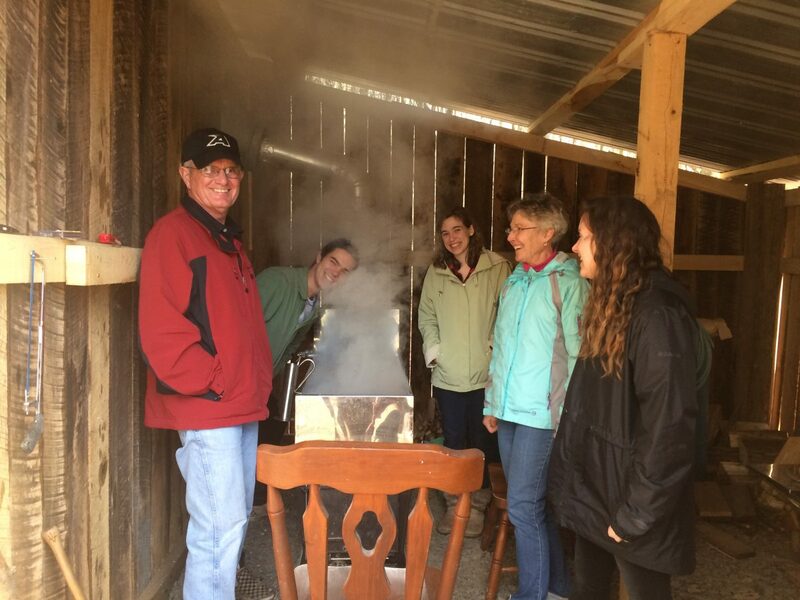 EXSEL interns tapped into new resources for spiritual and vocation development this year: lessons learned from the production of maple syrup. Because of unusual winter weather, the maple syrup flow started early, then waned, then began again. The team had to alter their plans time and again, and faltered initially. Though discouraged, they pulled through the difficult times together. Andy Matelski volunteered to work an all-night vigil in the shack, and others followed his lead. They collected sap, tended the fire, checked the syrup density, and finally filtered, reheated, and canned the sweet results of their labors. When the interns were digging the holes for the foundational corner locust poles that define and support the shack, they encountered an obstinate rock, which confounded the tractor-mounted auger. The hole had to be dug deeper or that pole would not serve its intended purpose. Digging by hand while lying on the cold, muddy ground, EXSEL intern Emma O’Dea finally managed to unearth the obstruction. To her surprise, the rock itself did not look as big as it seemed while trying to remove it from the hard earth—a ready metaphor for Christian obedience to the teachings of Christ, often difficult but always a joy once accomplished. Within the context of supporting White Sulphur Springs’ mission to the military, the interns engage purposefully in experiencing Jesus Christ’s life-changing power through the daily disciplines of reading, hearing, and memorizing God’s Word, prayer, constructive silence, meditation, and conveying thankfulness to their Creator. They are encouraged to practice personal holiness and to purpose in their hearts to trust and obey God, confessing their failings, receiving His grace and mercy, extending that grace and mercy to those around them, and loving others with a pure heart, clear conscience, and sincere faith (1 Timothy 1:5). Living in close community peels off layers of superficiality and exposes rough edges that, in turn, call for humility so they may love one another as our Lord Jesus teaches. The infrastructure for this groundbreaking endeavor is now firmly in place. The labors of this year’s interns will, with God’s blessing, yield much sweet fruit as future classes of EXSEL interns pick up the baton. The motto the interns selected to grace the bottles of finished syrup? “Oh, taste and see that the Lord is good!” (Psalm 34:8). As they Experience, Serve, and Lead here at White Sulphur Springs, the EXSEL Discipleship interns are helping military members and their families realize the restoration needed in these challenging times. ABOUT JIM & CLAUDIA: Married for thirty-seven years, Jim and Claudia serve together at White Sulphur Springs. Jim is a retired lieutenant colonel who served in the Air Force for thirty-three years, while Claudia is a veteran homeschool mom. They have five children (two of whom are veterans, one of whom is married to a veteran) and four grandchildren.